Looking to unlock immense potential of the Indian water sector, Danish companies seek to participate in the development of smart solutions for Indian cities, a report by Elets News Network (ENN). Denmark has expressed interest in creating an Indian water sector and discover the business potential India holds. This was revealed as leading Danish water technology companies joined the business delegation led by Minister of Energy, Utilities and Climate of Denmark Lars Christian Lilleholt at the 8th Vibrant Gujarat Global Summit held in January. Speaking during the inaugural session in the presence of Prime Minister Narendra Modi, the Danish minister extended offer to collaborate with Indian smart cities for developmental projects. Kamstrup, a leading supplier of energy and water metering solutions, was part of the Danish business delegation hosted by the Danish Embassy in India, Danish Ministry of Foreign. Affairs and Confederation of Danish Industry, strongly supporting the visiting minister’s agenda of building smart and liveable cities in India. 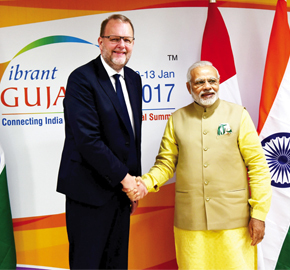 “We are excited to partner with India to discover the varied business potential this diverse country has,” stated Lilleholt who also held meetings with Prime Minister Modi and the Urban Development Ministry to define the roadmap for India-Danish relations and highlighted expertise of Danish companies. Speaking on the occasion, Suneel Bhambere, Country Manager, Kamstrup India, said distinguished nations perceive India as a preferred investment destination and “it is very encouraging for us to see global leaders coming on a platform showing trust in the policy reforms that the Government of India has initiated”. “Kamstrup sees itself at the forefront of smart cities bridging the gap between the high demand and technical expertise in the water sector to Indian smart cities,” he added. Kamstrup’s water solutions have reduced nonrevenue water with more than 50% in several projects, allowing a step-wise implementation. “More than 25 years of experience in smart water metering allows us to help utilities to reduce their energy bill, non-revenue water level as well as automating their work process in a very cost effective way. Our presence in India has already resulted in 10 folds of projects where we help water utilities to utilise the benefit of intelligent water metering,” said Senior Vice President Jesper Daugaard. The collaboration with experienced Danish technology experts will bring many possibilities to develop smart cities in India and Kamstrup is anticipating to be the intelligent metering partner for them.